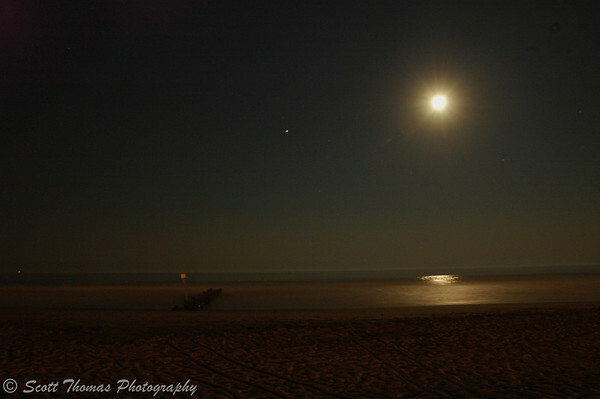 Full moon rising over an Ocean City, New Jersey, beach. Nikon D70/18-200VR, 30s, f/11, ISO 400, EV +0.3, 18mm focal length, tripod. Recently, I reviewed all my night images and found I had very few night photos taken of nature subjects. The Super Moon and the photo above are about all I have in my library. Kent had what I was looking for. 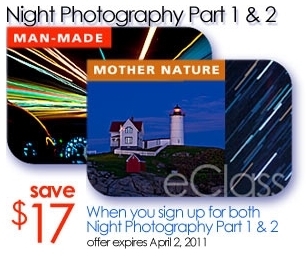 His next Night Photography eClass featuring Mother Nature starts in one week (April 8, 2011). The price is very affordable and is followed up with another Night Photography eClass about Man-Made subjects starting on April 22, 2011. Though I have a lot of experience with Man made night subjects with all my visits to Walt Disney World, the class will be stretching my skills with light painting and abstract lessons. I will be reviewing both of these classes for you. If you are interested in joining me, check out the links which have details of each class, videos where Kent gives you a rundown of each class and click here to read what past students think of Kent and his classes. There is a special price for signing up for both classes but you would need to do that by tomorrow (April 2, 2011) for the upcoming class. Kent runs these a few times a year so you will have other opportunities to take these or other classes he teaches. After a month of Close Up Photography subjects hope you are ready for lots of night photography! This entry was posted in Photography and tagged 18-200mm vr, atlantic, beach, eclass, kent weakley, moon, new jersey, night, nikon D70, ocean city, reflection, tripod, water. Bookmark the permalink. What an excellent idea! I will file these details away for when I am mobile again and can get out and about, for the day or night shots etc. Kent has these a few times a year. How is your recovery coming along? That’s a beautiful image, Scott. An eClass on night photography is very tempting. It’s one of those things I avoid for the most part because I don’t know what I’m doing. All the more reason to consider the class. Thanks for the links and info. You’re welcome. If you hop on one of these, let me know. Ooooooh . . . I am fond of nighttime walks and never manage to capture anything the way I’d like to. This should be interesting. If you are only going to have two “nature at night” photos in your portfolio, that’s a good one to have. I love the way the moonlight is pooled on the surface of the ocean. Thanks, Gerry. You would need to use a tripod which is probably not the easiest to do when walking your friends. I’m surprisingly adaptable . . . and sometimes I go on nighttime walks without them. Or nighttime observations, really. I don’t go far, just settle down in a likely spot and wait for the parade to pass me by. A person can see a lot that way. Wow, that’s beautiful! The spot to the left of the moon… is that a planet or just a spot from the camera? That is a planet. Photo was taken in mid-summer so I am not sure which one. Jupiter, perhaps. Light painting is a technique that has intruiged me for a while. Sounds like a great set of classes. I know there is something similar where i am. Last year a friend of mine took the course.